OK … Peter’s Woods is one of the oldest and earliest in my adult naturalist experience, and is amongst the best of them all. After graduating College, the girlfriend and I got married and moved into our first Home. We started getting to know our community. I joined the Willow Beach Field Naturalists (WBFN), and spent every Thursday evening at the Public Library (this was before the Internet) studying the plants, animals, and insects of the area. Someone at a WBFN meeting mentioned “Peter’s Woods”. I asked about it, and was told that it was the last remaining Oak Ridges Moraine “Old Growth” forest in Ontario. You can simply Google Peter’s Woods to get the whole historical story, but I can tell you now, the Willow Beach Field Naturalists deserve all the credit for the preservation of this now, Provincial Nature Reserve (http://www.willowbeachfieldnaturalists.org/about-us/peter-s-woods). I can’t walk the trail without thinking … this is Southern Ontario as seen through the eyes of native peoples for thousands of years. Long before the Europeans, my ancestors, this is what it looked like. Peter’s Woods is like my reviews of so many other trails. It’s a place I know so well, I just assume everyone knows about it. The first time I saw Peter’s Woods was in the dead of Winter a coupla decades ago. Ranger knew where to find it, and took me there. I could tell just by looking at it, even in Winter, that it was unique. It has since become a Provincial Nature Reserve and is expanding. While good people with good intentions are working hard trying to restore areas of Southern Ontario to their original state, Peter’s Woods was never altered in the first place. Of course, there’s always some influence from surrounding areas, but this tract of land has never been farmed, nor stripped of trees. Alright, that’s enough romanticism. After all, this is a trail review. Peter’s Woods (like most great places) is elusive, and easy to miss, especially if you approach from the North which is actually the direction most people would, due to the way the best roads are laid out. I would suggest you approach it from Hwy 45 (North out of Cobourg on the 401), to Cnty Rd 29, then East to McDonald Rd. 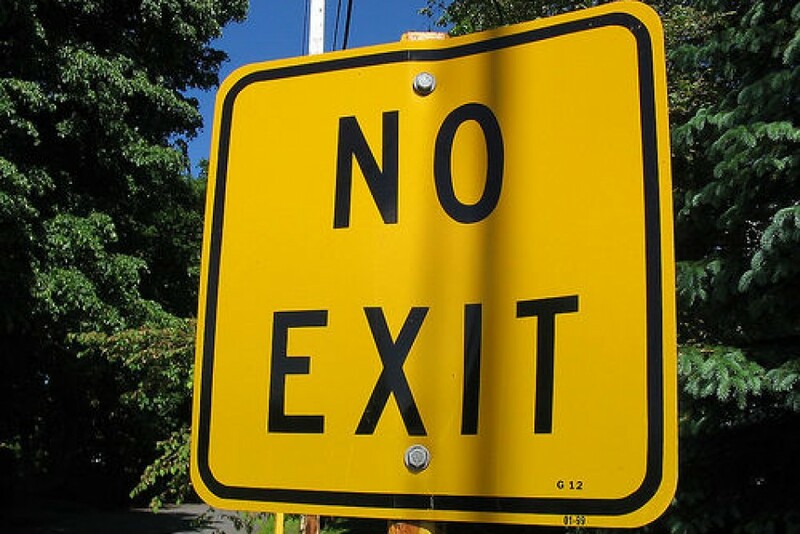 I would also suggest you exit the same way. The roads South from Peter’s Woods are sometimes not your best choice of driving surfaces. Though they are where the wife and I encountered a mass migration of millipedes (see For I Have Seen Millipedes Migrate) ***Update April 19, 2018 – The road from the South has improved considerably now so … you can take Lyle St (County Rd #23) North from the 401 at Grafton, to Centreton, where the road name changes to McDonald rd. Continue on McDonald to the location on the map above. As you drive down McDonald Rd toward the woods, your passengers will need to keep a sharp eye behind you, and to the left, as you round the curve ’cause the sign is facing away from you (to the South). Should you miss it, you can always turn around at the wide spot just past the curve and re-approach from the South where you’ll see the sign much better. Don’t let the condition of the road into the Woods, nor its width (or lack of width) scare you off. The road is very windy, but short. There’s parking for at least a dozen vehicles in the lot. There are even washroom facilities directly across from where you enter the parking lot, but that’s it. There are no picnic facilities here, and only a few benches to rest on along the trail. Peter’s Woods isn’t famous for a proliferation of wildflowers. But there are some rare Cucumber roots, Showy Orchis, and sufficient common wildflowers to make the walk pleasant in the Spring and Summer. Cucumber Root – a plant becoming rare because it’s thumb-sized root tastes like a cucumber. A 15 inch cucumber costs $1.50 … think about it. Showy Orchis – the first place we’ve ever seen one. The trees alone are reason enough to visit. You’ll rarely see beeches of this girth nor white pines for that matter, anywhere else. If a tree falls (unless across the trail) it’s left to degrade naturally. These fallen trees are the reason for what are called “stilt-walkers”. These are trees whose seeds germinated on the fallen trunks of other trees, sent out roots which crept over the fallen trunks to the ground and firmed up. When the fallen trunk rots away, the roots are left high and dry supporting the tree on “stilts”. Peter’s Woods also boasts two provincially significant ancient trees. A 450 year old White Oak and a 460 year old Sugar Maple. However, these woods are best known to us, for their incredible fungal displays in the late Summer and Fall. I have over 100 pictures of Peter’s Woods’ fungi over 3 years and have published a large .gif (see The Fungi of Peter’s Woods). There’s not alot of real estate involved here. The whole trail is less than a kilometer long but much like the Carstairs and Laurie Lawson trails, it’s laid out to feel like much more. UPDATE – July 6, 2018 – I have recently released a review of a set of trails just 3 kms South of Peter’s Woods also on McDonald rd. should Peter’s Woods not be sufficient a walk for you. The link is right here The McDonald Tract. I should point out that, while looking over some other internet trail reviews of Peter’s Woods (posted by plagiarists who’ve obviously never even been there), there are no meadows anywhere near the trail. It’s entirely through canopied forest and (unless there’s a Cessna overhead) is beautifully silent save a few birds, the wind, and the trickling of a coupla tiny streams. There are two fairly steep hills down and up again which might present a challenge in the Winter, but in the other seasons aren’t too bad. They’re not so steep that you can’t stop, stand, and look around. And you’ll want to. The views afforded by the hills are very impressive making the climb worthwhile. A lack of undergrowth allows an unimpeded view right across the ravine, and right down to the forest floor. Peter’s Woods is an historically and ecologically significant site. It deserves to be respected and treated with care. The trails are narrow and suitable for single-file walking for the most part, to reduce the damage your footsteps have on it. Leash your dog, and take your Tim Horton’s cups out. If you can’t manage that, then please just stay out ! I won’t apologize for my aggressive attitude ’cause I don’t ever wanna see this wonderful place become a garbage dump like so many others. I’ve read a few other reviews of Peter’s Woods and was shocked to read one mentioning mosquites. While there are a coupla trickling streams through the woods, I can count on one hand the number of mosquites I’ve encountered, once a week, every week, from last snow to first, for the last three years. This is NOT a buggy trail. There are (brand spanking new as of June 3rd 2018) washroom facilities back in the bush to the South of the parking lot and a few benches along the trail. There are no picnic facilities, which might be sad were it not for the “Codeman’s Fries” truck on the NW corner of Cty Rd 18 (Burnham St) and Cty Rd 9 (Oak Ridges Dr. which becomes Cty Rd 9 when you cross Hwy 45). It’s a bit out of your way (if you’re in a hurry to get back to the 401), but worth it (only open Friday, Sat, Sun). The wife and I have made a weekly tradition out of walking Peter’s Woods on Friday mornings and stopping off at Codeman’s for a feed of their famous fries. 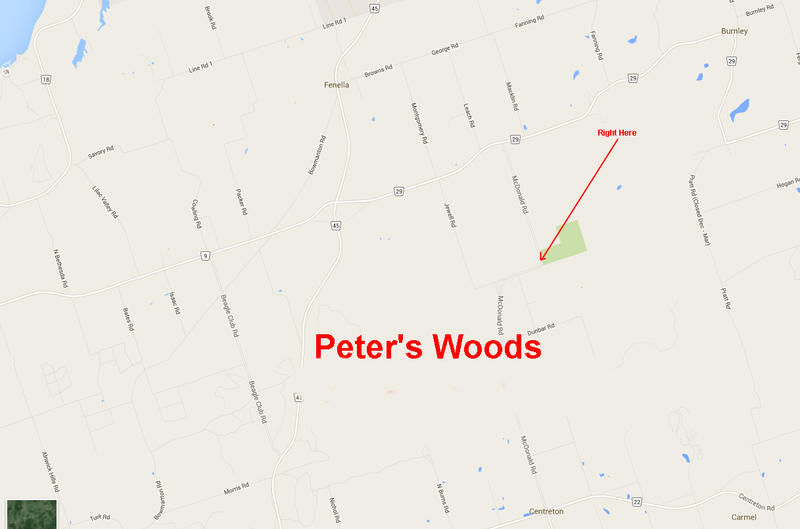 Thanks for writing about Peter’s Woods and sharing the pictures. Second best to being there to experience it for myself. Great review, Bushwhacker. This story caught my eye doing research on the Firefly Photinus ardens. Very rare, but apparently it’s in this bush. Photinus ardens eh ? And very rare too ? OK, I’ll have to study up on them and keep an eye out on our weekly visits. If I find any, I’ll take some macros for your collection. Peters Woods has become a Thanksgiving tradition for us. Short loop but does it ever pack a beautiful punch! We usually go around it twice. Something I should mention is we planned on do it late in winter, or perhaps it was early spring, and it was gated up. A little disappointing and something to keep in mind if you plan on going at that time of the year. Yes, they started that “closed gate” thing when it became a “Provincial” Preserve awhile back. We make a guess in the Spring as to when it’ll be open. If we guess wrong, there’s always Carstairs or the Elderberry to Dragonfly and Stonewall Loops right across the road from Carstairs’ parking lot. Or the McDonald Tract (and another right across from McDonald Tract which I’ll be issuing in a coupla weeks).